Alleged iPhone 5S photo shows "Touch ID sensor"
Mere hours before the Apple is expected to unveil a new iPhone with a much-rumored fingerprint sensor, an image of an alleged iPhone 5S user guide has materialized that features a combination "Home button/Touch ID sensor" at the below the screen. 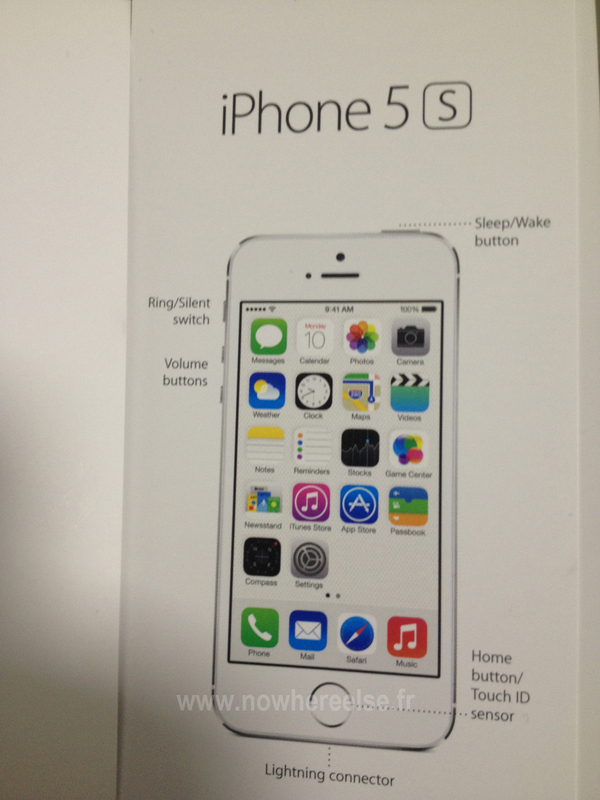 The purported guide photo, surfaced by Nowhereelse.fr, displays the locations of the physical buttons for what is identified as an iPhone 5S. Apparently sporting the new "flat" iOS 7 icons, the image also indicates the location of the "Lightning connector," "Volume buttons," and "Sleep/Wake button." The illustration emerges just hours after The Wall Street Journal reported that it had confirmed that Apple will include a fingerprint scanner on a high-end iPhone expected to be announced Tuesday. Supposedly working with a simple touch on the front of the smartphone, the security feature is widely expected to replace conventional four-digit passwords. Rumors that the Apple was working on incorporating such technology into its handsets began to mount last year after the iPhone maker bought fingerprint sensor and identity management software company Authentec. Meanwhile, an Apple patent application published in July by the U.S. Patent and Trademark Office describes a technology in which a sensor is used to determine whether a user has proper credentials to access the device based on the trace a person's finger and fingerprint. Apple is expected to unveil the iPhone 5S and a cheaper iPhone 5C model at a press event on Tuesday. Follow CNET's live blog at 10 a.m. PT to get a real-time breakdown of the event. This article originally appeared on CNET under the headline "Image of alleged iPhone 5S user guide notes 'Touch ID sensor'". Steven Musil is the night news editor at CNET News. Before joining CNET News in 2000, Steven spent 10 years at various Bay Area newspapers. E-mail Steven.